Glad you had fun!! Did you end up taking that Expertise/Sensor Cluster Draw, Cruise Inqy, & Nu build? Prockets, actually, and Rho with Deadeye. So good! "Almost as if they were actively working to prove the conclusions the US players were making about the state of the metagame"
So, just landed, back from the SOS Hannover! First off, I had a blast. Met great people and had a great time with people I knew! But I also got confirmed in my opinion. Only two list had no turrets, with NorraFennLow in one or NorraSharaJess in the other one. All others had at least one turret, often several. Most had highHP ships (9+) and pointfortresses (40+ points). That is just not the game I currently want to play. You all were right though: it was a lot of fun and definitely no waste of money as I initially feared. Recommend it! Nicely done, and glad you had a good time! Disappointing that it's in fact not the game you want to play - but I think the majority of players don't want to play that game either, and just haven't realized we're at that point yet. I was hunting down a ship with regen, 1 hull, 3 shield and a harpooned condition. When I hit a crit 4min before time I told him to do the harpoon first („one shield“) and then the other damage on shield. Of course harpooned deals a facedown damage card which would have won me the game. The judge was sitting next to us, watching, and he told us after we finished. I asked him later and they apparently had to take the stance to not interfere unless asked. The rules don‘t force them to act unless cheating, and he (correctly) thought we just mess the rule up without ill intentions. I‘m not sure I agree, but that‘s how they approached it. Same game, last turn. I shoot, finally strip the shields again, meanig next turn he‘ll die almost guaranteed against my double mod inq with prockets if range 1. We removed tokens, picked up dials, and then he realized he didn‘t shoot with a ship. We put the tokens back, he takes the shot and right as I pick up my dice: time over! That was hilarious timing, but there were several moments in the game where he was set and I was still thinking. Plus I gave him the shot, so I only have myself to blame. He is a good friend though and I‘m happy he got top32! edit: also, he had such a wholesome list called powerpuff girls: 2 ARCs and Jess! I won the rematch in hyperspace quite easily though, no clue why I struggled so much in the morning. When pressure was high. Oh, clue detected! Prockets are crazy cool. Even on Vader they seem really effective. That Expertise/Sensor Cluster Quickdraw is almost perfect and very well suited for whats out there right now. Just curious, did anyone shoot Quickdraw first? Just the powerpuffgirls guy. All other went for the boat or took the bait on inq when presented. a wholesome list called powerpuff girls: 2 ARCs and Jess! IF it has BB8 on an ARC, this list is already called BB-Arcgressive, due to the braze should who piloted it to a in in the height of paratanni and jumpmasters. It has DTF and Selflessness, making target priority a pain. I think Shara was the right call. I don't know about the old one, but this seems to have taken some FSR input and maybe combined them? Kyle+Jan means Norra has focus, TL, evade/focus, barrel roll on every turn. She can use Shara's lock to reroll, add her own, and get her 4-5 hits on every shot. edit2: and including FSR elements of DTF on a regen ship and selflessness on Jess means that you can't target Norra untill the other two are dealt with. I will allow it. Seems really close to the old BB list though. From the tourney regs: "When a judge is observing a game or an issue is brought to his or her attention, the judge should inform players when they are not following the game rules." That's pretty clearly the judge's responsibility. Didn’t you hear, @pheaver? The judges are our friends, and it’s mean to enforce the rules. Basically, judges are only needed if you need to reaffirm what you already know. Rules are for losers. 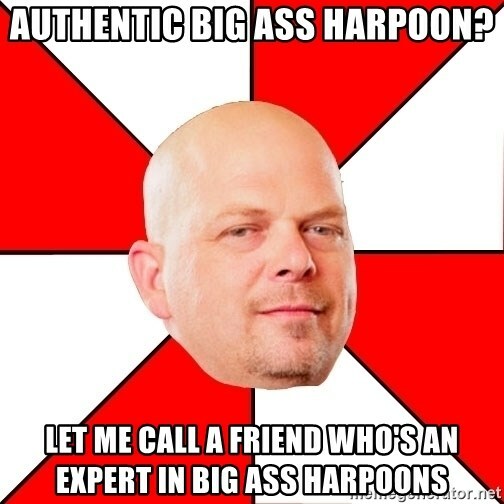 Harpoon casual. God ****, our Paul Heaver "Harpooned?" Condition cards can't come from the printer fast enough. Seriously though, WTF is with judges not enforcing the rules? Many TO's are primarily community organizers, rather than rules-experts: I've seen similar things happen in 40k. That's why I try to know the rules so well- at my first LGS when playing X-wing, the TO barely knew the rules of the game and made really bad calls like TLT doing 1 damage as well as whatever was uncancelled, or saying you only got to roll defense dice once vs. Cluster Missiles, or Gunner only working if you got no (hit) results. It's a cultural thing, not just x-wing. Holding people accountable requires confrontation. People are less and less willing to do that. Me and our local rules guy (usually a/the judge at our store champs) lightly pressed the point. I was salty and he was irritated - we both didn‘t understand. I will ask again if he remembers the reasoning, but iirc the point was that they will only answer questions and not interfere on their own unless they spot someone cheating. We mentioned that one could be ‚missing‘ a non-optional trigger intentionally and that is cheating, but I don‘t remember the reply. What do they think cheating by missing mandatory triggers looks like? Doing it with a goatee? I'd like to say it's a byproduct of social media, where you can just ignore anything that you disagree with instead of having a discussion, but it's obviously not anything particularly new. Wow, I quoted the relevant text from the tourney regulations. Feel free to pass that around and remind the judges they are there to do a job, not just hang out and measure arcs all day. EDIT: Why isn't there a mustache twirling villain alt for some agency stealing card. Come on, I just lost in the cut when I asked. That‘s the worst moment to argue about rules. I was salty enough but only let it show by telling the story and laughing about it. Arguing instead would have made me actually salty AND a sore loser on top. I try not to take it too seriously. I played my first game against someone who thought Jan Ors is once per round PER SHIP! And the german card really is misleading, so I dropped it and told the player after to check the english card and ask a judge if they didn‘t believe me. By the way, that makes Miranda, Fenn and Low pretty resilient! Oh yeah, you did the right thing by not arguing with a judge. That never ends well. The most you can do is go to the Marshall and have a conversation about this not happening to anyone else in the future. Or, if the Marshall blows you off, sending an e-mail to FFG Organized Play. In premiere events, judges are expected to know the regulations and rules pretty well. And the floor rules, if we had any. Yeah, not the time to argue, I'm disappointed in them, not you!